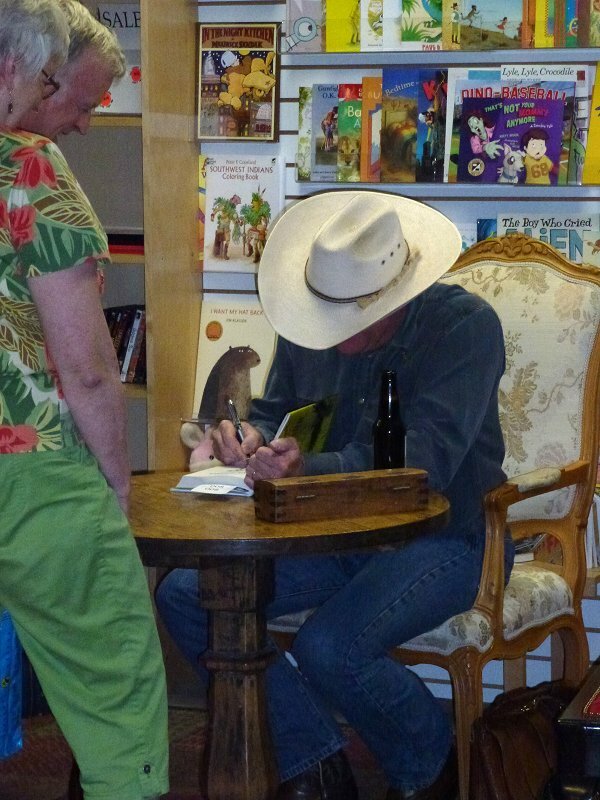 Craig Johnson @ The Poisoned Pen! I don't attend many things at night if it means I'm driving because I have wonky eyesight and oncoming headlights have a tendency to blind me. All that's going to change after this evening, I am happy to say. Craig Johnson (one of my Top Five Authors) appeared at The Poisoned Pen (my #1 bookstore) tonight, and although Denis would've loved to go, he had to work. I'd had seven chances to see Craig and had missed them all because Denis was working or I was being a chicken about night driving. I decided it was time for that nonsense to come to an end. How did I manage to put a stop to missing Craig Johnson when he's in the Valley? I drove my husband's Jeep. You know, the one that's jacked up high so Denis can negotiate rough trails out in the middle of nowhere. The one that's jacked up so high that there are days when I want to call up to Denis, "Throw down a rope!" Yes, that Jeep, the little beauty. It's a little beauty because it sits up high enough to keep my eyes out of the line of fire from oncoming headlights. That one little detail all on its lonesome is enough to make me dance around the house, but wait-- there's more! Getting to meet Craig Johnson was sublime. He's one of the few authors who's come to The Poisoned Pen to sign each one of his books-- even though he had to hop on his motorcycle to come down here when his publisher said "no tour" for his second book. 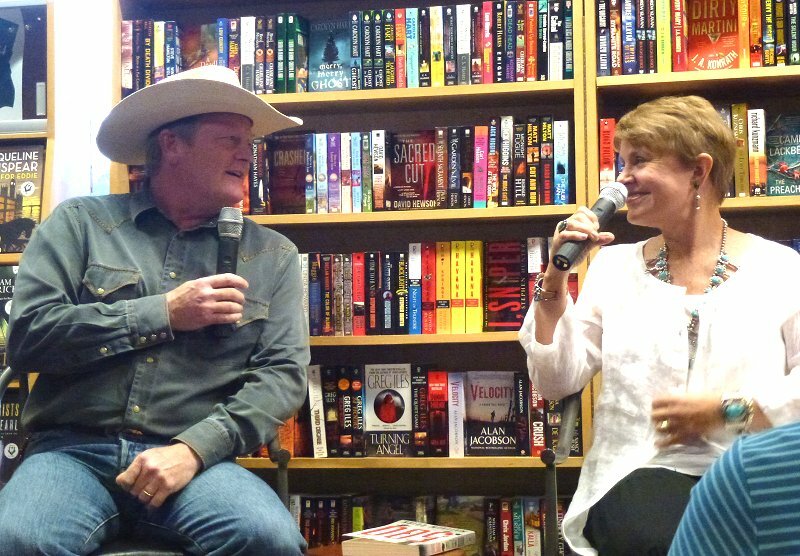 Craig and the incomparable Barbara Peters (owner of The Poisoned Pen) began the evening by talking about "Longmire," the television series based on Johnson's books that will debut on A&E on June 3. 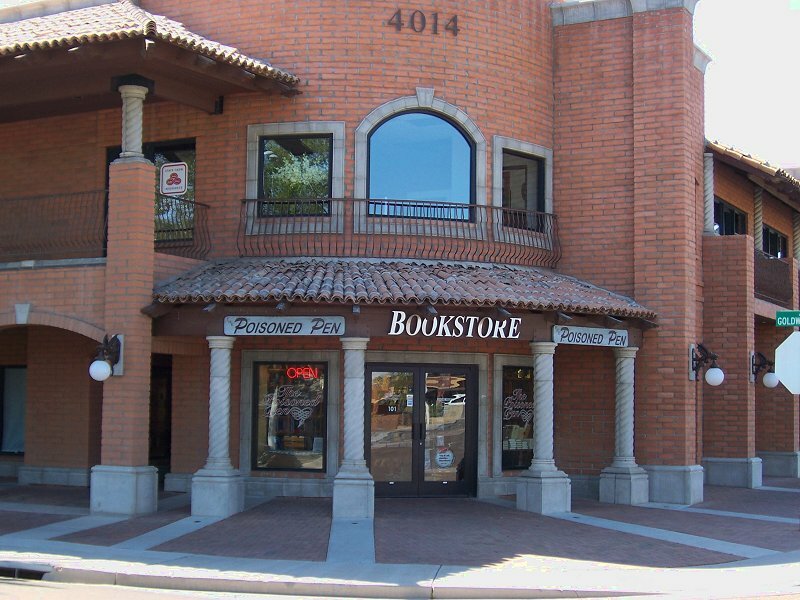 Some of Craig's friends advised him to retain the rights to his books for as long as possible. The wait is over, and the professionals who are filming the series seem dedicated to doing the books and the characters justice. Craig has been enjoying the entire process, especially going over the scripts which is where he feels he's of the most use. 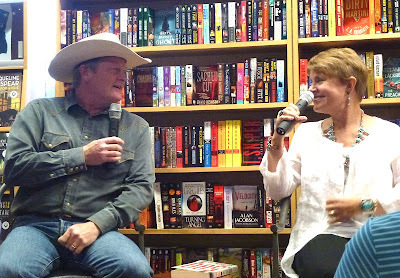 Barbara Peters remarked that "Longmire" reminded her of "Bonanza" which made Johnson chuckle, but Peters backed up her remark by saying that the same things that made "Bonanza" such a long-running television series-- characters, relationships, and place-- were at the heart of "Longmire." When Judy Johnson first saw the rangy, six foot four Robert Taylor, she said, "He moves like a Westerner." She also looked at her husband and said, "He's the Hollywood version of you: taller, better looking, and with a better voice." 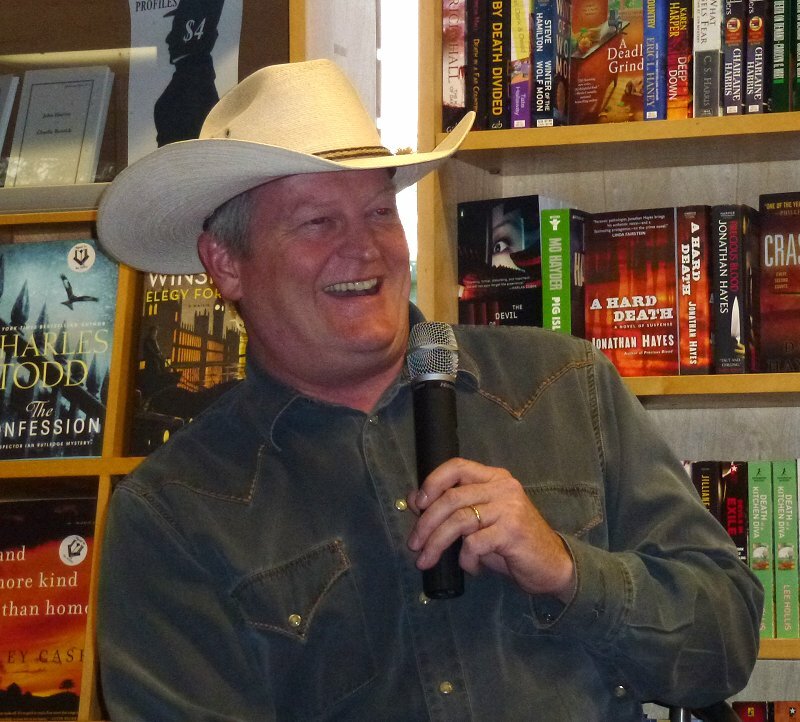 When Craig Johnson first heard that Robert Taylor was being considered for the part of Sheriff Walt Longmire, he said, "He's dead." Once he understood which Robert Taylor was being referred to and had gotten a chance to meet the actor, he was pleased with the choice. 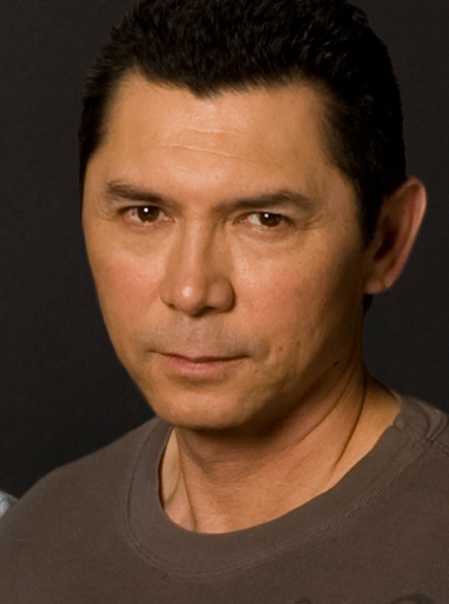 Johnson is also pleased with the choice of Lou Diamond Phillips to portray the Cheyenne Nation-- also known as Henry Standing Bear. He impressed Johnson when he tested for the part. The lines he was to speak were riddled with contractions. Phillips spoke his lines-- with no contractions. Johnson thought to himself, "That [man's] read my books!" Phillips has portrayed Lakota and Navajo characters in the past, and he knows each tribe has its own customs and ways of looking at the world. The actor took the time to spend a few days on the Northern Cheyenne Reservation, and he was actually adopted by the tribe. Craig looked at us all and said, "You know... 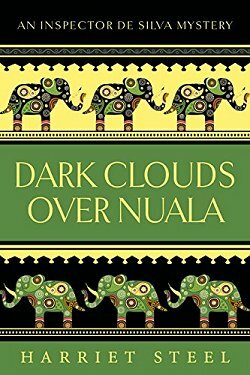 I've been writing these books for eight years, and I haven't been adopted into the tribe!" At first, Johnson was uncertain about the casting of actress Katee Sackhoff as Victoria Moretti. She looked good, but that's just superficial. How did Sackhoff's character match up with the fiery Vic? He looked up one of her interviews on YouTube. Sackhoff told the interviewer that she grew up with four brothers, who are all loggers in Oregon. Johnson also noted that Sackhoff's language was liberally sprinkled with words beginning with F. "She's perfect!" Johnson declares. When Peters asked him if he thought television was going to have a big effect on how he writes his books, Johnson replied with an emphatic "No!" going on to say that he lives a very insular life. He's only written eight books so far, and the first season of "Longmire" consists of ten episodes. He feels that the series and his books are both free to go their own way and still compliment each other. 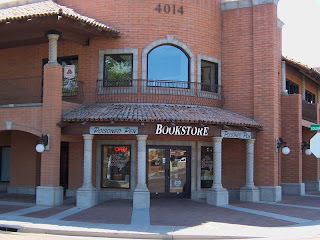 When Barbara Peters mentioned the colorful titles to his books, Craig replied, "Colorful books! It must be the French influence [where Johnson is so popular]-- chartreuse. Don't leave it on your nightstand, it'll keep you up all night!" He mentioned that he prefers having a completed book "in the bag" before he starts a book tour. He does have a finished book, but he's not happy with the title, so we'll just have to wait to see what the winner is. When Craig told us that he has a two-sentence contract-- "It must be a mystery. It must have Walt Longmire." -- I had to smile, and I also smiled when he said that there was definitely a non-Walt book in the future. 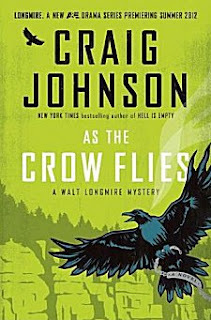 (Of course, I'd start reading the phone book page for page if I found out Craig Johnson wrote it....) There are many possibilities in the future of the Walt Longmire series of books. For instance, how about Saizarbitoria running for sheriff? As the evening drew to a close, Johnson jumped back to the topic of the television series when Barbara asked him if the role of Dog has been cast. He made us all laugh when he told us he was asked what breed of canine Dog was. When Craig started listing all the different breeds that comprised Walt's faithful companion, the production team was horrified. "He's a mutt?" they cried. The reason for their unhappiness is the fact that they are required by law to have four dogs ready for filming. It can be difficult enough to find four suitable purebred dogs to cast as one single character. The odds of finding four comparable mixed breeds was not going to be easy! 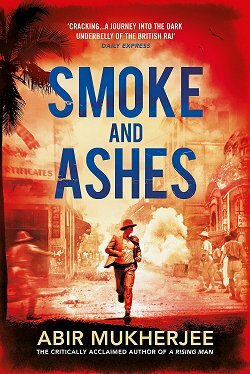 Before we reluctantly adjourned for book signing, Johnson had one more story to share. 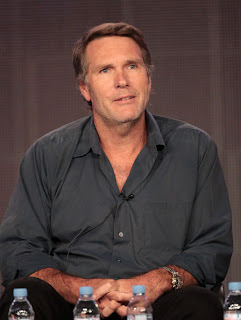 He's been able to inject his special brand of humor in the "Longmire" series, which led to his telling us about a friend who was out camping and pouring himself a cup of coffee from a Thermos when he looked up to see a grizzly bear standing there. Having heard that you can scare some bears away by making loud noises, Craig's friend began banging his Thermos and cup together. Unfortunately, the bear was a trash can habitué, and the metal objects clanging together sounded like his favorite food containers being delivered right to his door. All I can say is that, by now, I've heard so many ways to scare off bears that I hope I never meet one in the wild... I'm hopelessly confused! Wonderful, wonderful post. As I said to you on FB, I have the first two books on my tbr pile and now I have seen a picture of the author, I must get to them. And now I'm also wondering if we'll get the TV series! I suspect not, so hopefully dvds will be available in due course. If they're not made available in any format in the UK, you can always check YouTube. Denis found all the episodes of a series Billy Connolly did about traveling the length of Route 66 on YouTube when he couldn't find DVDs in either the US or the UK. We're spoiled because we have a DVD player that plays UK DVDs, but I was thrilled when Denis found Billy on YouTube! 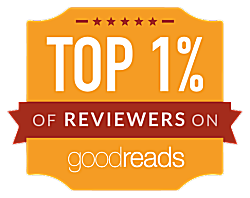 Cathy - Thanks for this terrific post on a great author! I love this "inside look," too. I'm so glad you enjoyed it, Margot! I'm glad you figured out a way to get out at night! That sounds like a fabulous event! It was, Kathy! It is such a high to finally meet one of my favorite authors! Craig Johnson sounds like my kind of guy and I'm so anxious to read his books but keep committing to others. Must get organized! Glad you found a way to go out at night since Denis works then. No one should be missing things like this due to fear of anything. Stop committing to others and commit to Craig and Walt, you hear me?!? ;-) Honestly though-- you're going to kick yourself when you discover what you've been missing!!! Yeah, I only try to have big fears like causing a twenty car collision slow me down. But. No. More! I'm glad you got to go! This was an interesting post, and I like your other recommendations too. 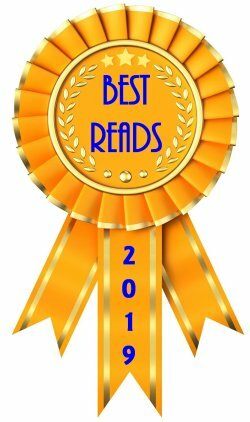 I read Crooked Letter, Crooked Letter, and loved it and Who Do, Voodoo looks good, too. Glad you stopped by, Dorothy! So far, Who Do, Voodoo? is good. In fact, when I'm finished commenting, I'm heading back to it! Sounds like you had a lot of fun. I've never heard of his series, so I will have to check it out and the show. Yes, you will have to check both out, Ryan! I saw him speak at the Tucson Festival of Books last year and he was very entertaining! I'm glad you had such a good time!